Planetary Geology Studies The Geology Of Planets. Planetary Geology is a study of planets in our solar stsem. 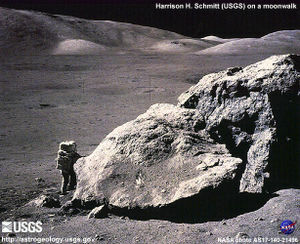 Planetary geology, alternatively known as astrogeology or exogeology. Planetary geology is a planetary science discipline concerned with the geology of the celestial bodies such as the planets and their moons, asteroids, comets, and meteorites. Although the geo prefix typically indicates topics of or relating to the Earth, "planetary geology" is named as such for historical and convenience reasons. The study of rocks originated with studying rocks on Earth, and due to the types of investigations involved, planetary geology is closely linked with Earth-based geology. Planetary geologist and NASA astronaut Harrison "Jack" Schmitt collecting lunar samples during the Apollo 17 mission. Eugene Shoemaker is credited with inventing the Branch of Astrogeology (now called the Astrogeology Research Program) within the U.S. Geological Survey. He made important contributions to the field and the study of impact craters, lunar science, asteroids, and comets. The Visitor Center at Barringer Meteor Crater near Winslow, Arizona includes a Museum of Astrogeology. J. F. Bell III, B. A. Campbell, M. S. Robinson (2004). Remote Sensing for the Earth Sciences: Manual of Remote Sensing, 3rd, John Wiley & Sons. Roberge, Aki (1998-04-21). The Planets After Formation. Department of Terrestrial Magnetism.